I mean, look at it. 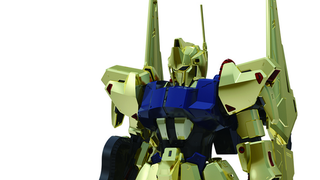 It's literally a gold plated giant robot. Well, a model of said giant robot, but still, gold! That's the sort of fanciness I can totally get behind. The Hyaku Shiki, or Delta Gundam, appeared in the second and third series of the long-running anime franchise, Mobile Suit Zeta Gundam and Mobile Suit Gundam Double Zeta, the first of which is celebrating its 30th anniversary this year, hence the Gundam getting this new updated kit in the Gunpla (the Gundam plastic model kits that are almost as old as the franchise itself — and actually saved it from obscurity) 'Master Grade' line. Why deck out your giant fighting robot in gold? Well frankly why the hell not, but also in the show the real reason was that gold offered some resistance to the beam weaponry that is so popular in the Gundam universe (as we've previously established, there is basically a Beam version of EVERYTHING). It merely happened to have the additional benefit of making the Delta Gundam look wonderfully opulent. The 7.3" tall model is fully articulated when you've finished building it, so you can pose it to your hearts content, and it comes with a variety of accessories: several beam sabers, a beam rifle and a Clay bazooka. There's no release date or price for the Delta Gundam just yet, but I'd be willing to bet a $100+ price tag thanks to the gold plating.